We honestly can’t think of a superhero film that has gotten as much backlash BEFORE it was even released – rumours of production troubles, the criticism of casting certain actors in certain roles due to the colour of their skin, changes to the characters and origins that have remained pure ever since their comic book debut; all the signs were pointing to Josh Trank’s Fantastic Four reboot being an overwhelming mess of a movie. Well, we’ve officially seen it – only a couple of days before release, like the rest of the world – and we can confidently tell you, that after all the negativity, all the bad-mouthing on IMDb message boards, and all the bad signs pointing to the likely outcome that this would be a gigantic flop of a movie, that Fantastic Four v.2 is… okay. That’s it; just okay. It’s not good, it’s not bad; it’s just okay. How’s the acting? It’s okay. How are the effects? They’re okay. How’s everything else? It’s all okay. There is simply nothing about this movie that transcends further than “okay”; it’s just earth-shatteringly “meh” from beginning to end, and after all the negative buzz that seemed to be promised another major superhero catastrophe on the scale of Green Lantern or even Man of Steel, it’s a little disappointing that it’s not worse than it was made out to be. 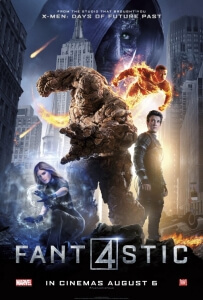 Let’s go over the problems that everyone seemed to have before even seeing the damn thing, starting with the de-aged cast – a slew of young actors including Miles Teller, Kate Mara, Michael B. Jordan and Jamie Bell have been brought in to play Reed Richards/Mr. Fantastic, Sue Storm/The Invisible Woman, Johnny Storm/The Human Torch, and Ben Grimm/The Thing respectively, which seemed to annoy fans that they weren’t older like their comic book counterparts or even – God forbid us – the 2005 version which is now only noticeable for having future Captain America Chris Evans as The Human Torch. Really, there’s no real reason for them to be young adults as opposed to actual adults, other than perhaps younger actors would have probably been more bankable in our strange ongoing quest for fresh blood in movie tentpoles; but it didn’t really bother us that much, and they’re all okay performances by each one of them, although they have certainly been stronger in other projects we have seen them in. Perhaps one of the most controversial decisions in making this film – at least, in the eyes of the Internet – was the casting of an African-American, in this case Michael B. Jordon, as a character who up until now has been predominantly white. We’ve never understood why so many people were against this because, honestly, who friggin’ cares? So what if he’s a different colour than we’re used to, as long as he’s a good enough actor to harbour the role decently enough then it shouldn’t be that much of a problem (and if you do have issues with the fact that he just happens to have darker skin, then you may have some serious problems of your own). Again, he’s fine here, and he’s certainly more tolerable than Evans was in the previous films, so no need to really worry here. By the way, they do establish that Mara’s Sue Storm, Johnny’s biological sister in comic book lore, is the adopted daughter of Johnny’s father Dr. Franklin Storm (another House of Cards veteran, Reg E. Cathey), which is fine if you’re willing to accept that in this new version. There have also been hundreds of rumours that, allegedly, the studio clashed heavily with director Trank (here making his second film after found-footage superhero movie Chronicle) on set, with reshoots and re-editing all being handled by producers Matthew Vaughn and Simon Kinberg – and honestly, you can see that in the final product. There are definitely hints of what Trank seems to have been aiming for, a more character-based superhero film that focuses on the relationships more than the hum-drum superhero activities, and it’s an admirable effort with moments of the characters bonding being brief but all around decent; but you can also tell the signs of studio notes all over the place, especially when there’s even the slightest reference to a popular character name or catchphrase. Most notable of the latter, however, is the third act which descends into that sort of stock “superhero(es)-must-defeat-supervillain-to-save-the-world” plot we’ve seen time and time again; and it’s all over so quickly and rather anti-climactically that you’re actually shocked that it’s over and done with as soon as it began. Any fans of the mega-villain Dr Doom, played here in both human and altered form by Toby Kebbell, will also be disappointed in how little screen-time he gets as the classic villain that he is (he’s only in it for the last 10-20 minutes, tops). However, his new design is by far and away more awesome than his previous Julian McMahon incarnation, and some of his powers are actually quite intense, especially one that harkens back to Scanners (without giving that tidbit away). But overall, for everything that could have been so bad about it, like Batman and Robin or X-Men 3 bad, Fantastic Four is just okay at best. It’s a slight improvement on the campy Tim Story versions from the past decade, but that’s not saying much; it’s just a stretchy flaming invisible rock of okay-ness – and certainly not fantastic, by any means. Fantastic Four isn’t the major disaster everyone feared it would be, but it’s definitely not fantastic, either – at best it’s only okay, with a lot of developmental problems and pacing issues dragging it down while occasionally reaching the surfacing.